Most people get an overview of a place using Google maps. 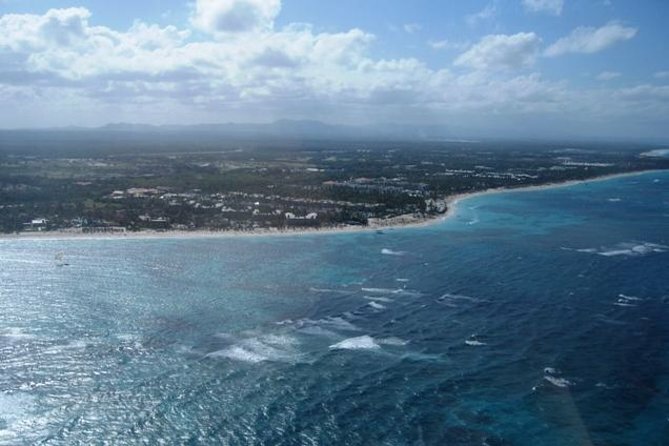 Experience real bird’s-eye views of southeastern Dominican Republic on this helicopter tour over Punta Cana. Soar over the endless expanse of the Caribbean, spotting tiny white sailboats and maybe even dolphins frolicking in the turquoise waters. Long white stretches of beach, dense tropical woods and a shipwreck are all part of your aerial tableau. Choose a flight from 10 to 30 minutes, and enjoy convenient hotel transport. Start with pickup from your Punta Cana hotel at a time convenient for you, and head to a nearby helipad. After checking in, meet your pilot and receive a brief introduction to helicopter safety. Then board your helicopter and take off! During the flight, listen to commentary about the sights from your pilot through your two-way headset. Choose a flight duration of 10, 15, 20 or 30 minutes. Fly over the beaches of Bavaro and El Cortecito, where most of Punta Cana’s resorts are clustered along the white-sand shoreline. Get a kick out of seeing your own hotel from the air, and zoom by the manicured grounds of seaside golf courses. Soar above the sun-dappled Caribbean Sea and enjoy your sky-high vantage point of reef formations and waves that look like paint strokes. Your eagle-eyed pilot points out any dolphins and sharks darting in the turquoise waters. Head to Arena Gorda Beach in northern Punta Cana, and see the Astron shipwreck. The longer you’re in the air, the more coastline you’ll see. Depending on flight conditions, fly to secluded areas boasting the most luxurious resorts, and past the hotels where the shoreline hasn’t been developed yet. Much of Punta Cana remains jungle, unreachable by car, so the best way to see these dense verdant landscapes is from the air. Then, enjoy a smooth flight back to the helipad. When you land, your tour ends with transport back to your hotel. Due to comfort and weight / balance of the aircraft, passengers weighing over 300 pounds (136 KG). will be required to purchase an additional seat. This is payable directly to the tour operator on the day of the tour.